Use 1 pound jumbo shrimp, precooked frozen, peeled and deveined, tails can be either on or off. The most important thing to remember with this recipe is to completely thaw the precooked, frozen shrimp in a colander. When most of the water drains off, pat dry the shrimp as much as possible with paper towels. (Or start with fresh, peeled, deveined shrimp, precooked. A lot of grocers will steam them at no extra charge.). Turn your burner on medium high (almost high) and set your large non stick skillet or wok over the burner. When skillet begins to get really hot, but NOT smoking, quickly add the melted butter and shrimp. Sprinkle on the Caribbean Jerk Seasoning to taste. It’s hot and spicy so be careful if you don’t like the heat. Keep the shrimp moving in the pan, glazing the shrimp with the hot butter and spices. Cook just until hot and slightly browned. (only about 3 minutes or even less depending on the heat of your skillet). 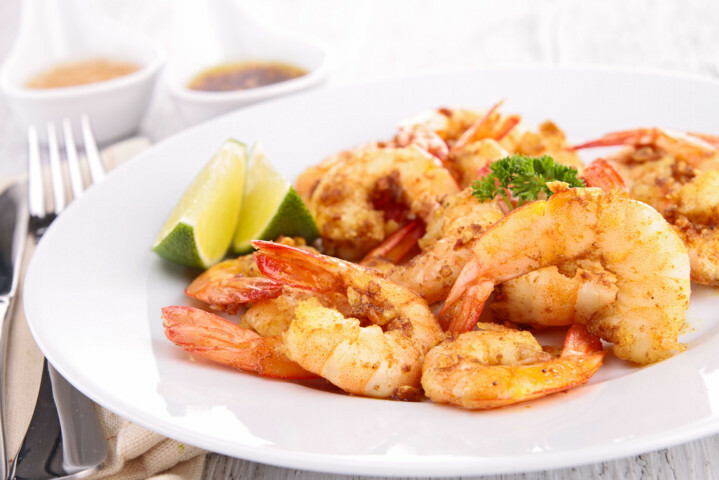 You can also make these in the broiler or on the grill after tossing the shrimp in melted butter, sprinkling on Caribbean Jerk Seasoning and spreading them on a broiler pan or open grill. Broil for only 2 to 3 minutes, watching closely.